Canada's own Tegan and Sara are back with their highly anticipated sixth album release, 'Sainthood,' and have plenty to show for it. After their 2007 release, 'The Con,' the Quin sisters set the bar very high in order to top such an incredible album but, 'Sainthood' seems to have done the job with ease. The album is definitely more band/instrument orientated than any previous release from the duo but their blend of vocal harmonies and catchy melodies, mix together to create this incredible fusion of music which is irresistible to the ear. 'Hell', the first single to be lifted from the album, reeks of perfection. You can immediately see why it was the first choice for the single, with its fantastic guitar riff and catchy chorus: 'I know you feel it too, these words get over used...' reminding everyone of the indie-pop sensation the Quin sisters are; it deserves to flood radio stations and television with airplay. The album fits so well in chronological order with sensational opener 'Arrow' going straight into 'Don't Rush'. It leaves you just wanting more and more, which 'Sainthood' delivers. 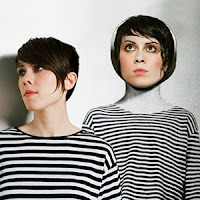 According to the duo, "Sainthood is about obsession with romantic ideals. It's inspired by emotional longing and the quiet actions we hope may be noticed by the objections of our affection". Just after the first couple of plays, you cannot help but see the connections with songs like 'On Directing', 'Alligator' and 'The Cure'. For fans who are looking for 'The Con: Part Two', they are going to be disappointed. 'Sainthood' is 36 minutes of gold and was worth the wait. The only thing fans will crave after this, is hearing the new songs performed live. Sainthood is out October 26th (UK) / 27th (US/Canada) on Sire/Vapor Records.